When I was a young school kid, if someone had told me that I would still be doing book reports, I probably would have laughed. And yet here I am, of middling thirties deciding independently on my own that I want to do “book reports” again. Some may be long, some may be short. Some may be good reviews, and some may be bad. I’m hoping I read more good books than bad. Although heaven help me, one of the worst books I’ve ever read I couldn’t put down. Please don’t make me mention it. I’m truly embarrassed. 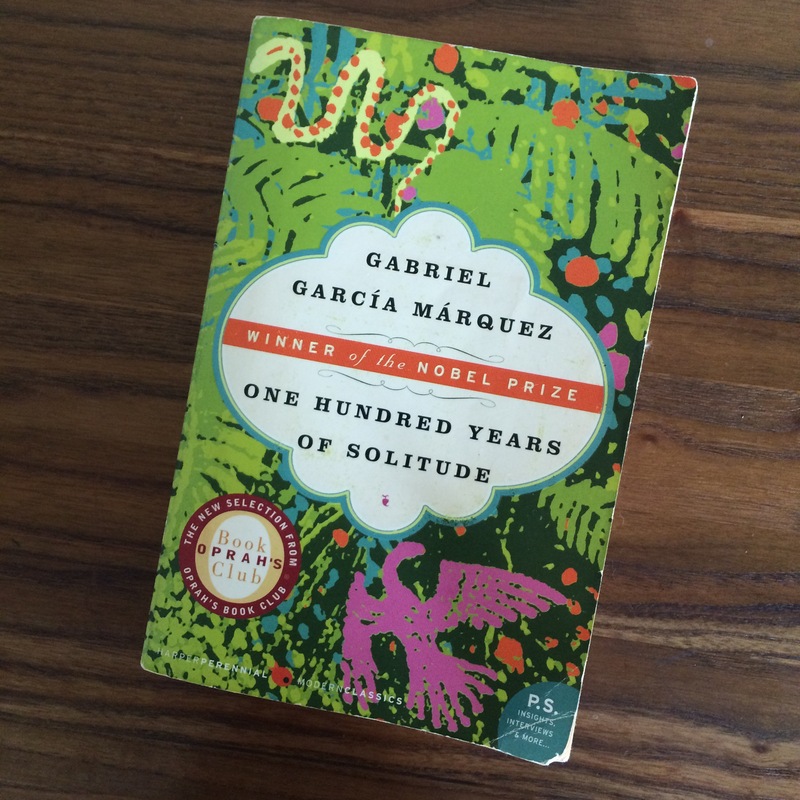 So, to kick my new book review postings off we’ll start with One Hundred Years of Solitude by Gabriel García Márquez. One Hundred Years of Solitude took almost that long for me to finish (well, minus 90 years). A decade ago the scent of freshly printed pages filled my head and fueled my imagination as I meandered through the aisles of a bookstore, searching for something to distract me from a post break-up aching heart. The vibrant greens of this book drew my eye (I know it’s said to never judge a book by its cover – but I believe we all do to some point, at least initially). I reached for it not realizing it would be ten years later before I came to the end. The verdant lushness of the cover that enticed me melds perfectly with the damp wilderness that would become the town Macando, founded by a group of semi-refugees lead by Jose Acardio Buendía from Riohacha (vaguely identified as somewhere over the mountains). The “where” and “when” of Macando took time for me to decipher – perhaps the residents of Macando also felt the same confusion, as time and distance stretched and contracted and repeated with the annual visit of gypsies, perpetual habitation by ghosts of relatives long past, and the mysterious parchments written in a strange touch – the deciphering of which one male from each generation would attempt to undertake at one point or another. The novel follows the family of the Buendías from founders of a flourishing town, pillars of the community, to the eventual demise of both good name and town. An epic saga of bitterness, obsession, and the pig-tails that may not have grown on the body but are there in the heart. Translated into English by Gregory Rabassa, the words are evocative, merging mystical happenings next to the mundane. The assumption of Remedios to the everlasting battle with red ants are spoken of in the same matter-of-fact way. The story meanders a bit, following one family member, and then without warning the mention of another will detour the story. Even with the non-linear plot the language of the story kept me hooked (at least this second time around). 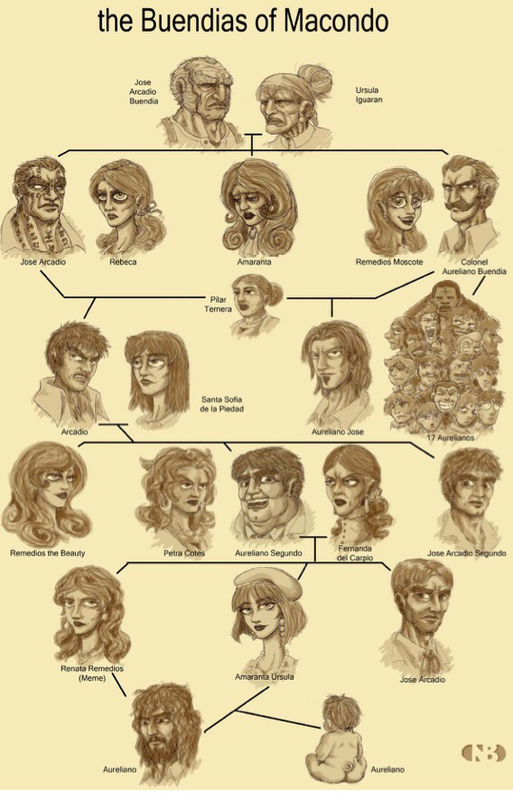 With the continuous repetition of Jose Acardío’s and Aureliano’s in this novel I had to reference the family tree depicted at the beginning of the novel often, quite often in fact. The repetition of names annoyed me during the first half of this novel. Why would a family continue to use the same two variances of the same name? Why would an author torture his reader so? Even the females were not immune to the repetition, but on a lesser scale. As the story continued its spiral path to the ending, I began to see the point Márquez was attempting and my annoyance disappeared, replaced with a slight smile and nod to the novel in my hands. Well done, sir, well done. Mysterious parchments left by Melquíades, the ethereal gypsy friend of Jose Acardío (the first), were obsessed over by generational members of the family and then, as was wont to be were distracted by new obsessions (usually love). Like the characters in the book I also became distracted from this novel. This is not a novel you can put down and pick up a few months later – not unless you have a much better memory than I (which is quite possible- my memory is… What was I saying?) Anyway, the first time round non-linear trajectory of the novel did not hold my attention when came up against my new obsession… also love. There are no time for books when LOVE has first sprung! Luckily this book still graced our dusty shelves when I was looking for a tactile book to hold. I love my Kindle app, but sometimes I want to feel the paper under my fingers. I am glad I picked up this masterpiece again. It’s not easy reading, and sometimes it’s not even that enjoyable – it can be disturbing and unsettling or even slightly boring, but those are all parts of the journey for the life and death of the Buendías, those are all parts of the journey for our own lives.